On Nov. 5, UPS begins serving customers in Fargo and surrounding areas of North Dakota and Minnesota with jet service to and from Fargo’s Hector International Airport. 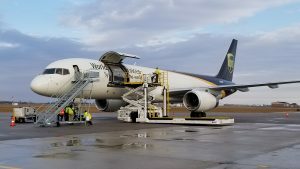 A UPS 757 cargo jet, carrying a payload of up to 87,000 lbs., will operate twice a day between Fargo and UPS Worldport, the company’s main air hub in Louisville, Ky. The flights are a non-stop link connecting Fargo with UPS’s global delivery network, and enable later pickup times for package shipped from the Fargo area. Nine smaller turboprop aircraft also will be based in Fargo, providing service to central and western North Dakota and northern Minnesota. To staff the new airport facility, UPS has added about 70 new jobs to the local economy.